Takes you through the colorful and popular world of everyday American slang and idioms used by all native speakers of English in the US. It has been featured on CNN, BBC, Voice of America, and several other international TV broadcasts. English language learners. ELL. 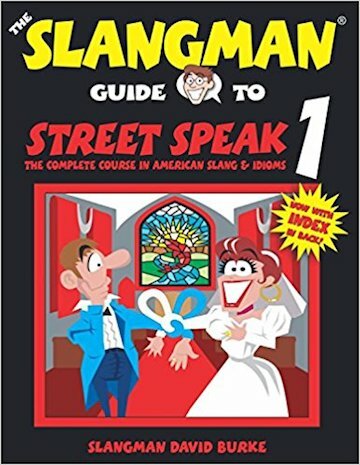 For ESL (English as a Second Language) students, this book equals years of living in the USA and will help you to quickly integrate into the American culture by learning not only the slang and idioms, but well also take you through the contractions and reductions used by everyone such as I dunno (I do not know) and Djeet jet? (Did you eat yet?) and so many others. Entertaining dialogues, activities and games will make sure you have a blast (have fun) and dont sweat it (get tense) as you get up to speed (become current) on all the typical slang and idioms used by virtually every native speaker! So chill out (relax), kick back (get comfortable) as you learn the real language spoken by virtually all of us in the USA!